Battle Phrog, move over to make room for the fighting Osprey. In the latest milestone in the Marine Corps’ slow, bittersweet farewell to the CH-46E Sea Knight — aka the Battle Phrog — the last of the twin tandem-rotor transport helicopters with Marine Medium Tiltrotor Squadron 265 flew their final departure flight from the flight line at Futenma Marine Corps Air Station in Okinawa, Japan. It wasn’t a long trek: The helicopters were headed to Camp Kinser, the Corps’ logistics camp on the island, for “official disposition,” according to a III Marine Expeditionary Force article. Those longer legs will be sought-out by III Marine Expeditionary Force and Marine Aircraft Group 36 in Japan and around the Far East and western Pacific, including Australia, where the Marine Corps plans to rotate a force of 2,500 in four or five years, and in Guam, where it plans to shift nearly 5,000 Marines from Japan, along with a mix of vehicles, equipment and aircraft, likely including a squadron of MV-22 Ospreys. With its rotating nacelles that enable it to fly like an airplane, the Osprey can go faster, farther and higher than the conventional helicopter, or just hover like helicopters and access smaller, confined landing zones or decks of ships. “Bringing in the Osprey gives us the ability to go about three times as fast and four times as far. They provide a long reach and over-the-horizon capabilities,” says Staff Sgt. Bradley A. Lee, a “Dragons” crew chief with VMM-265. Not everyone was celebrating, though, as the Osprey arrived in Japan over protests over its presence and safety worries from locals. But routine flights that began in October continue through this fall and winter. In case you’re wondering, the Phrog flying in the photo, above, is older than most Marines serving at Futenma: The aircraft, bureau number 154034, entered the Marine Corps’ inventory in 1967, according to helis.com. It was the CH-46D back then. 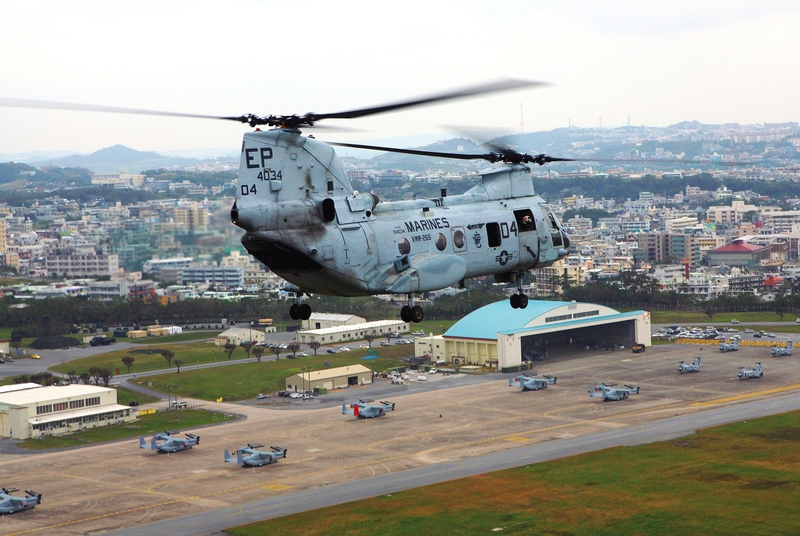 Meanwhile, the Phrog’s unique sound signature — thanks to its tandem rotors — will continue to echo along the Futenma flight and surrounding urban neighborhoods for several more months. The “Flying Tigers” of Marine Medium Helicopter Squadron 262 will keep flying their CH-46Es until next summer.